Who might have thought about the destruction and loss that Kerala had suffered from flood in July 2018? According to the reports; the floods have affected unparalleled demolition, left hundreds lifeless and enforced a million people to take accommodation in relief camps. The causes that resulted into this flood in kerala were concluded to be low pressure; heavy rains; large expulsion from dams; and landslides. The entire state including the major tourism destinations like Idukki, Muunar, Kumarakom, Alappuzha, Thekkady and others were under total mess. The situation was so severe that Kerala Tourism even urged to the travelers for not coming to their state until the life settles back to it platform. However by now i.e. September 17, 2018 the situation is better and under control. Life in Kerala is coming back to the routine and the people have started their businesses as well. I happen to visit one of the famous tourist destination in Kerala; the Kumarkom last week. Kumarakom being a scenic tourist spot in Kerala is well-known for its backwaters and the Vembanad Lake offering the delightful houseboat rides. The flood had cut off the Kumarakom from the mainland with no means of transportation plying because of the flooding. Now that it is recovering bit by bit to its routine after last month’s flood chaos that had distressed the holidays in Kerala would be a wiser plan again for several national and abroad tourists. The restoration has sparked confidences of countless citizens who depend on the travel industry in Kerala. To understand the present situation of Kumarakom’s best properties for tourists, I visited these 3 resorts in Kumarakom. It is completely safe to stay here now for holidays as the water has reduced and the hospitality at the resorts is back in its usual shape.Tourists to Kerala can plan either trips or holidays to the resorts as they were planned earlier. The resort management has taken over the responsibilities again to serve the travelers for holidays in Kerala with all the amenities and delicious cuisines. The view from this resort in the scenic and indeed beautiful lake Vembanad is soothing. The resort is all set to welcome its guests for a comfortable and luxurious stay in the rooms, cottages and suites. After being awarded as the “One of the most Luxurious Holiday Destinations in the World” by BBC; the resort has fought back to flood to hold its pride back. The rainy season that started in Kerala on May 29th 2018 broke up the water levels in the Vembanad Lake to rise above 5 feet and more. It resulted as flooding in most of the lake facing resorts and hotels. But now Kumarakom is preparing a campaign known as ‘Kumarakom is Safe,’ with the aim of attracting more travelers and tourists from all the parts of the world. You can even plan a road trip as the roads are now re-built and safer as compared to what they were before. The lakes are even more beautiful than they were prior to flood. 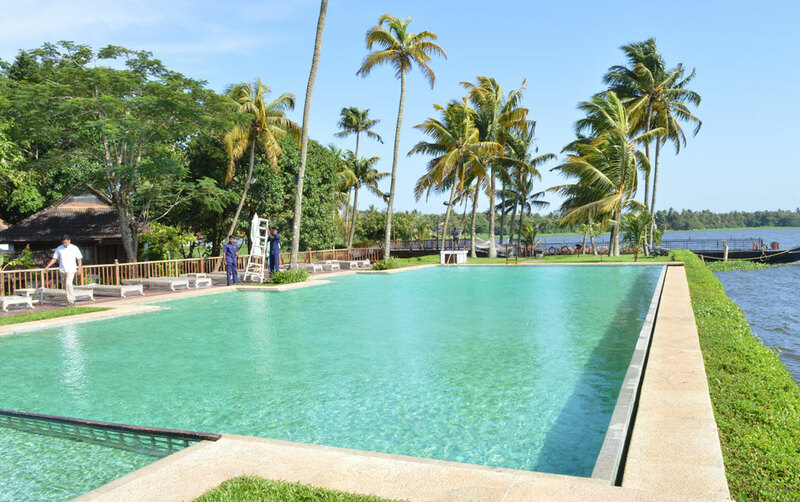 Plan a trip to Kumarakom now to experience the best of the holidays in Kerala.